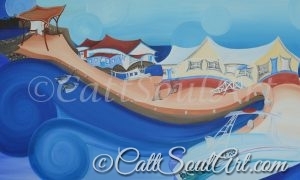 Artworks created for and inspired by the beautiful island of Turks and Caicos. My brother was living and working on this Island and I was inspired to create a series of work based on his photographs and stories. It is the first time that I have painted street scenes and landscapes and I really enjoyed this new way of working and the style I developed for it, through a stack of preliminary works and sketches. The paintings took me approximately a year to complete from the initial design process, working out the sizes I wanted to work on to accommodate bulk shipping restrictions, having the frames made, stretching the canvases and the completed paintings. I really enjoyed the new challenges of this project and discovered a passion for painting buildings! The style is inspired by a Greek artist, Xanthos Hadjisoteriou, who’s work I fell in love with when I first came to Cyprus. The paintings were completed by around the middle of 2016 and later shipped over to Turks and Caicos from Cyprus where they were created. They were then put into storage until they could be taken to the gallery by a representative. Due to complications this took much longer than expected . The Caribbean islands were then hit by hurricanes and the islands were left in complete devastation. You can imagine my amazement and delight this week when I was informed that all the paintings have miraculously survived the hurricanes and devastation. Sadly I believe that the buildings depicted in some of the paintings may not have. Eight of the total of twenty six artworks orientated around Turks and Caicos have finally made it to the gallery this week where they will be on permanent exhibition. The other paintings will be exhibited there at later dates.